I love baking, especially cakes, and I'm always eager to try new things and new flavours. 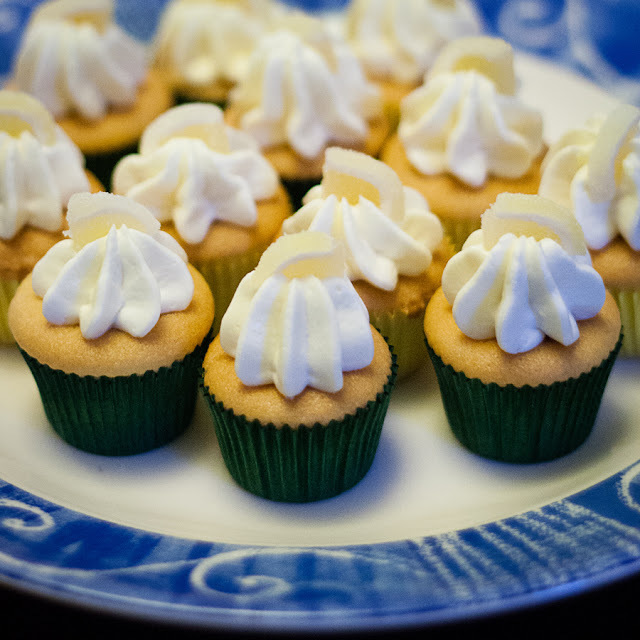 I was hosting my flute group last week, and, armed with a new mini cupcake tin, I thought it would be nice to have a spring like flavour for our refreshments. So I went with lemon mint. Naturally the first thing I did was google for ideas. I really liked the idea of infusing butter with mint flavour I saw on Stephen Andrew Jones' lemon mint cupcake recipe. I wanted to use ingredients I had in the house, though, so I decided to modify my current favourite basic cupcake recipe. I added a ton of different flavourings because I wanted the taste to be stronger as I sampled the batter. I'm very lazy and now I have a stand mixer I don't bother folding flour for small cakes, I just try not to mix the flour for long. Preheat the oven to 175-180deg C, depending on your oven. In a bowl, chop up the butter and the mint leaves, and put the bowl in a saucepan 1/3 full of water over a medium heat to melt it. Allow to sit for a few minutes (up to 15 - I did less as I was in a hurry) and take off the heat. Strain out the mint leaves and leave to cool (I hurried it up in the fridge). Cream the butter and sugar in a stand mixer if you have one. Add each egg with a spoonful of flour to prevent curdling. After the third egg add the lemon juice, tea, lemon curd, peppermint extract, orange flower water and vanilla. Turn the mixer down to low and add the flour. Mix until combined. Spoon the mixture into cupcake or mini cupcake cases, and bake for 15-20 minutes until golden. Remove from oven and cool on a wire rack. I made standard buttercream (150g butter, 300g icing, 2 tablespoons milk) but used single cream instead of milk and added equal amounts of lemon juice and spearmint tea (1/2 tablespoon of each) and equal amounts peppermint extract and orange flower water (a few drops each). Everyone loved them - my flute group, my church group and some work colleagues. The flavour was strong enough to be distinguishable in the cake instead of coming just from the icing. A recipe I hope to make again.